Tina's Creative Studio: Get 2 extra stamp sets for free if you join Stampin Up by June 30! Get 2 extra stamp sets for free if you join Stampin Up by June 30! If you're anything like me, papercrafting is a big part of your life. If you'd like to find a way to either get goodies at a discounted price and/or subsidise your spending on craft supplies by selling to your crafting buddies, then why not think about joining Stampin Up? Many people (including me) join Stampin Up to get the best quality product at a discount. I've been a Demonstrator for over 8 years now, and have had lots of fun doing what I do. I've not found it difficult to meet the minimum required to maintain my status, and I enjoy getting together with friends and new people to share ideas and create things. I'm also a member of a couple of private Facebook Groups with other Demonstrators and we get to share more ideas. 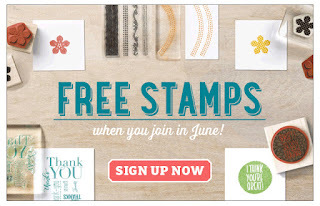 For the month of June 2015 only, Stampin Up is offering 2 free stamp sets when you join. You still can choose the content of your starter kit, which has a retail value of $235 for just $169. The quickest and easiest way to join is online, and you can do so HERE.